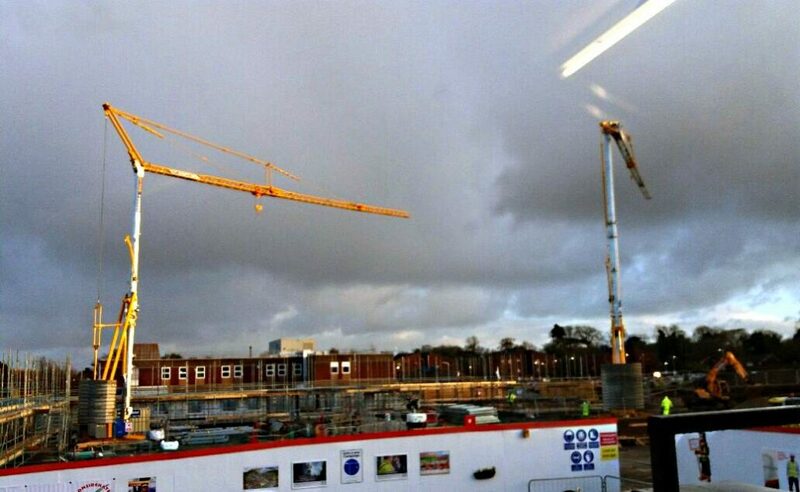 Two of our Potain Self Erecting Tower Cranes are currently working side-by-side on a construction project in Grimsby. The Pedestrian Operated Tower Cranes, a Potain IGO50 and Potain HUP 40-30, are due to be on site for over four months, working on the project which involves the construction of 124 flats, 96 student rooms with associated communal spaces and a central support hub, with associated landscaping, access and parking works at the Diana Princess of Wales Hospital on Scartho Road in Grimsby. We added the Potain 40-30 Self Erecting Tower Cranes to our fleet in September 2017 and they have been in high demand since then. Both cranes offer unique advantages including, but not limited to, increased efficiency and lower costs. The Potain HUP 40-30 has a 40m jib and will provide a maximum capacity lift of 4,000kg out as far as 13.2m and 1,000kg at the end of the jib. It has a height under hook of 30m. The Potain IGO50 also comes with a 40m jib and will provide a maximum load of 4,000kg out as far as 13m, 1,000kg at the end of the jib. It has an available height under hook of 23.2m.